View of the inside of Melrose Abbey. In 1136 Cistercian monks from Rievaulx Abbey in Yorkshire were asked to establish an abbey by King David I. He intended this Abbey to be built on the site of an earlier Abbey on the banks of the River Tweed. This had been built by St Aiden in the 7th century however the Cistercian monks worked the land to supplement the income of their abbey and so needed to be near good agricultural land so they based the new abbey a few miles away at Melrose. The construction of the complex of buildings at Melrose took about 50 years but these were destroyed by Richard II’s English troops in 1385. 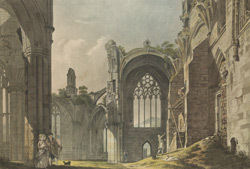 The remains depicted in this print are those of a 15th century church built to replace the original Abbey.